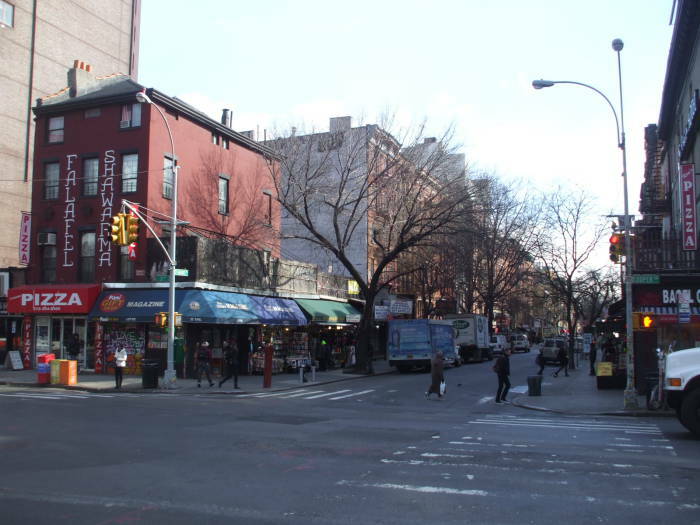 We're on the corner of East 8th Street and Third Avenue on the boundary between the Bowery and the East Village, looking across Third Avenue and east down what is 8th Street behind us and from here west for three long blocks is known as Saint Marks Place. 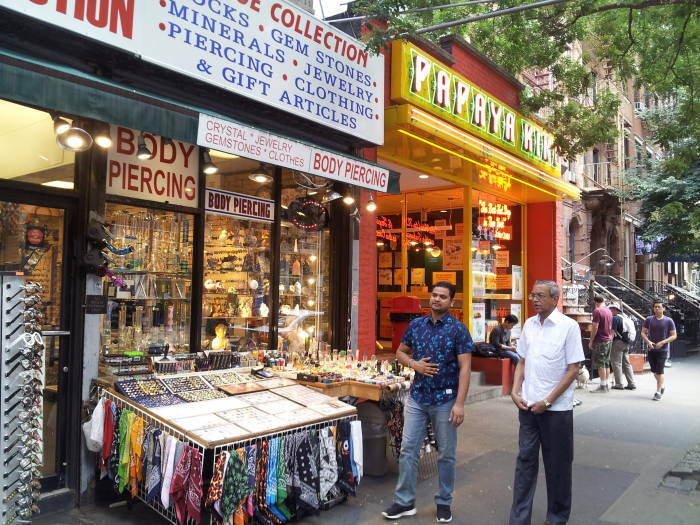 There is a prominent sign for a falafel and shawarma place at the corner, and then as we go down the north side of St Marks Place we pass several open-front stores with gifts and trinkets followed by Papaya King. The main building of the Cooper Union for the Advancement of Science and Art is directly behind us. The street coming in from behind us to our left is East 8th Street. 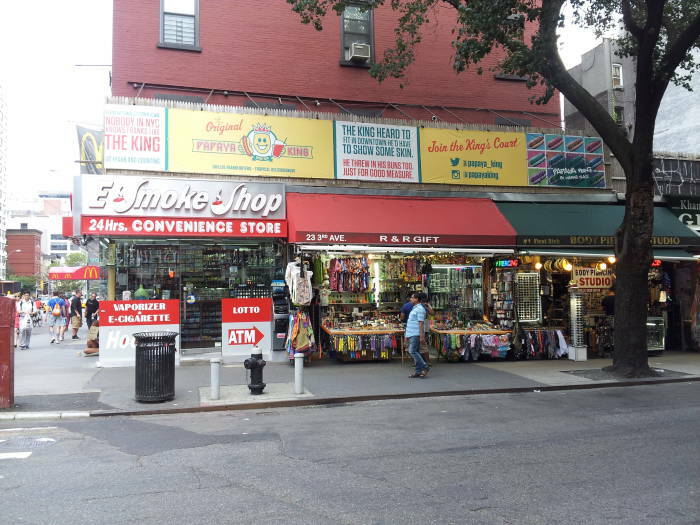 It started as West 8th Street at its intersection with Sixth Avenue, also called the Avenue of the Americas, then changed from West to East at Fifth Avenue. 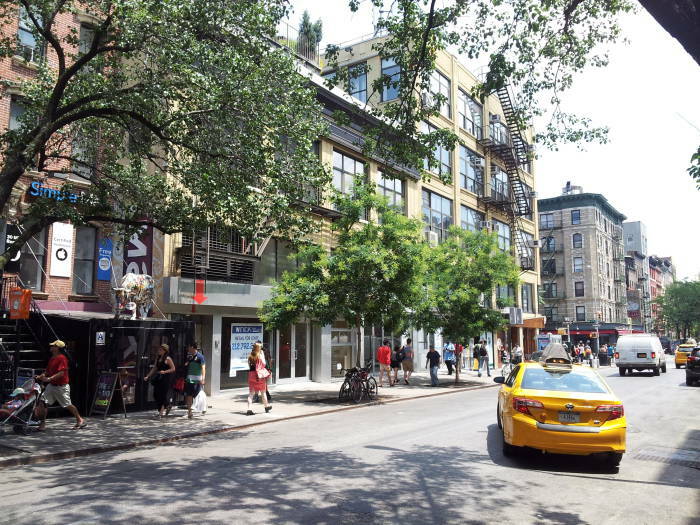 Across the intersection with Third Avenue ahead of us its name changes to St Marks Place for the next three blocks — to Second Avenue, then First Avenue, and then Avenue A and Tompkins Square Park. 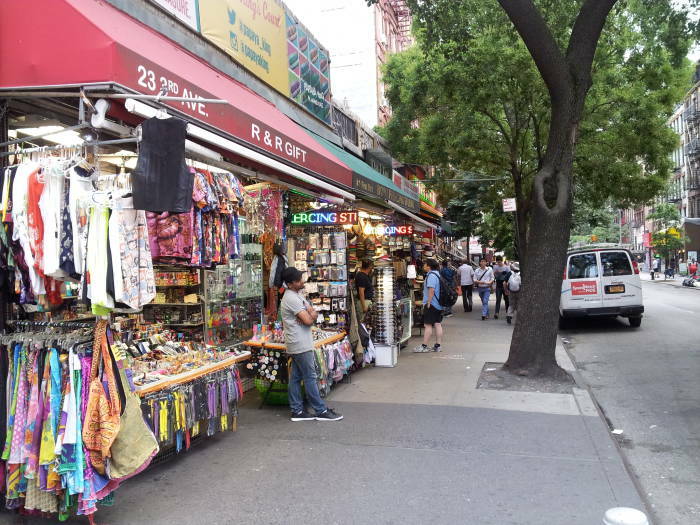 It is interrupted by the park, then it's East 8th Street again for its final two blocks from Avenue B across Avenue C and ending at Avenue D.
The buildings near the corner are very short. 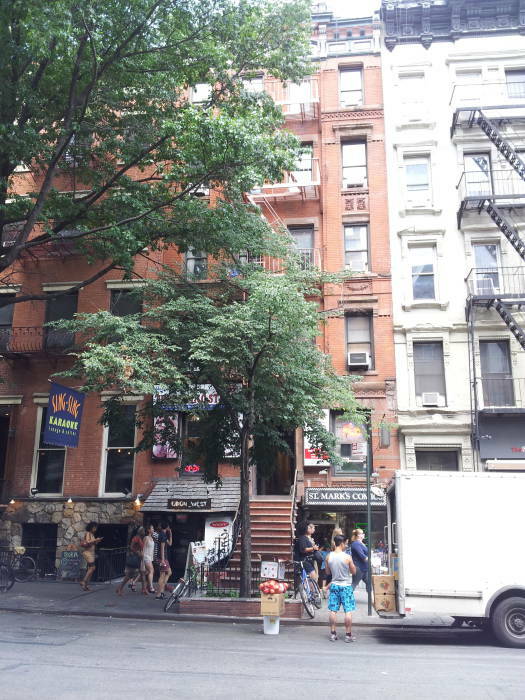 The first tall old building is at #5, where we also start encountering Japanese izakaya style places slightly below sidewalk level. 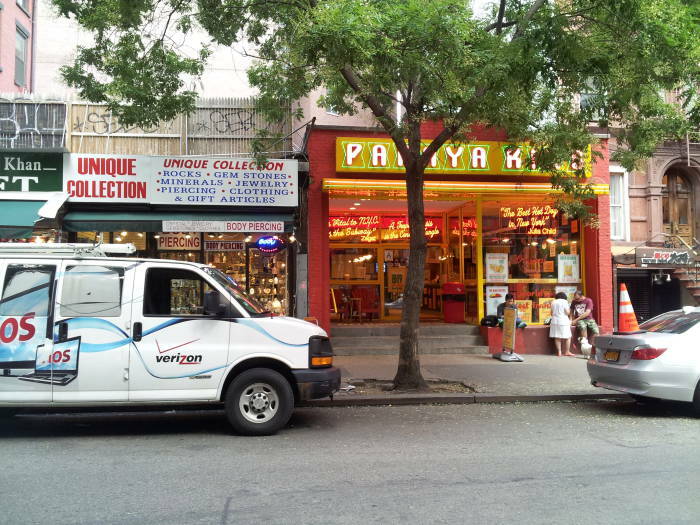 #11 includes Udon West and the famous St. Mark's Comics below street level. 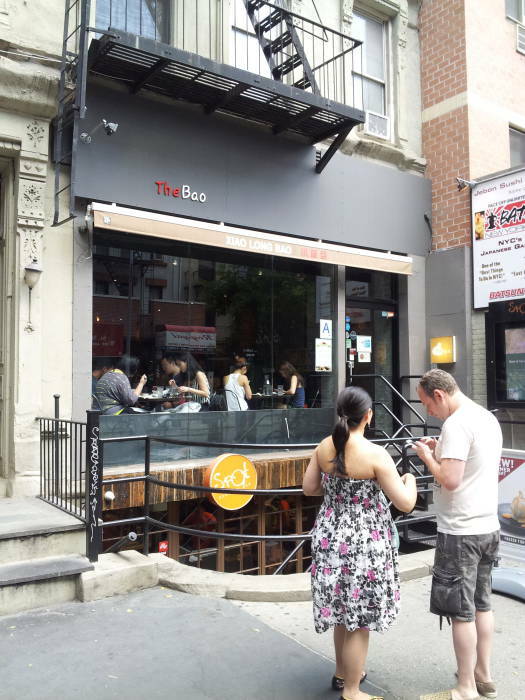 #13, currently with the Korean restaurant The Bao at street level, was home for Lenny Bruce in the mid 1960s. 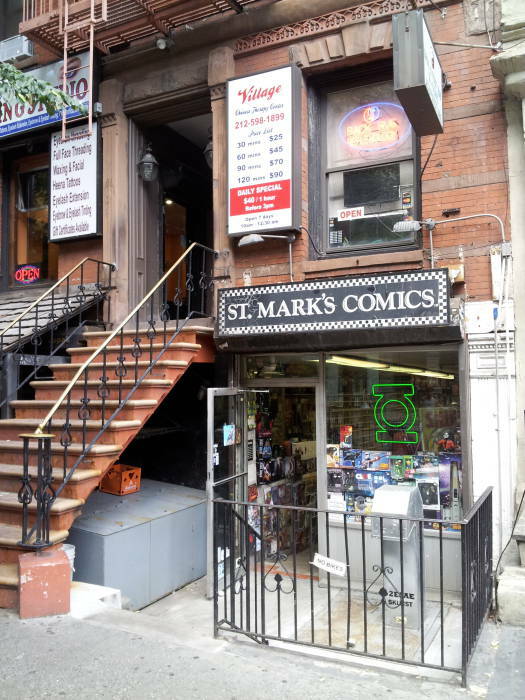 The ground floor and basement was home for several years to St. Marks Bookshop, which has moved multiple times since then. 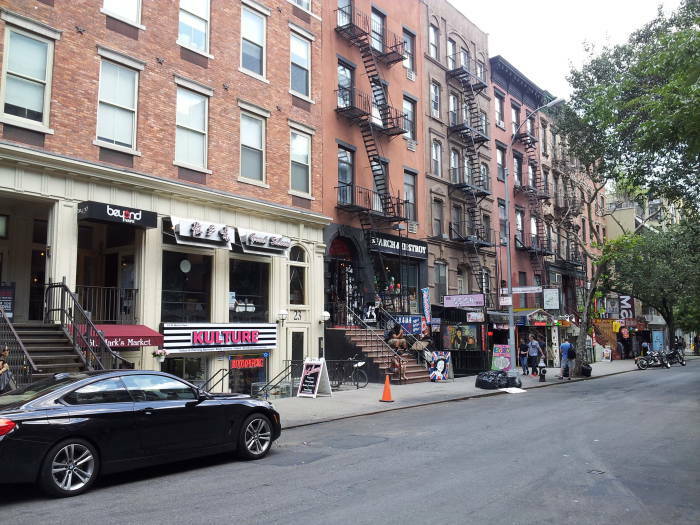 #15 St Marks was once Paul McGregor's Haircutter, where the Shag haircut was supposedly invented and where Warren Beatty, Goldie Hawn, and Faye Dunaway had their hair cut. Beatty's film Shampoo was supposedly based on McGregor. 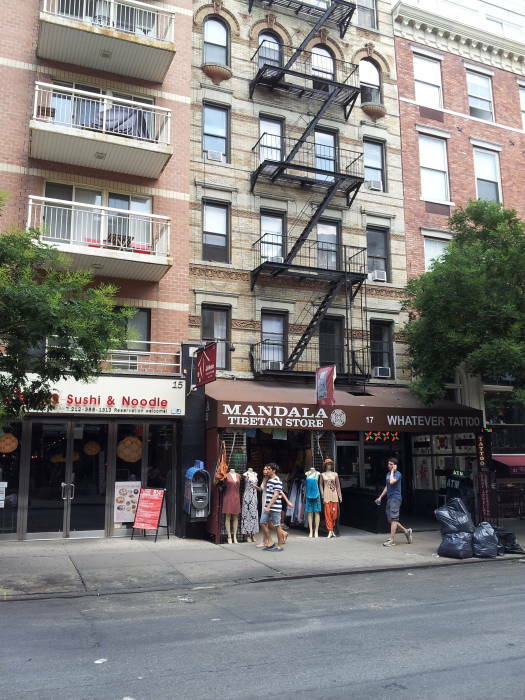 #17, currently the Mandala Tibetan store, was the 1885 site of the first Hebrew-American Church in America, a not very successful project to convert Jews to Christianity. #19-25 was once the site of Arlington Hall, built in 1833 as a German musical hall. 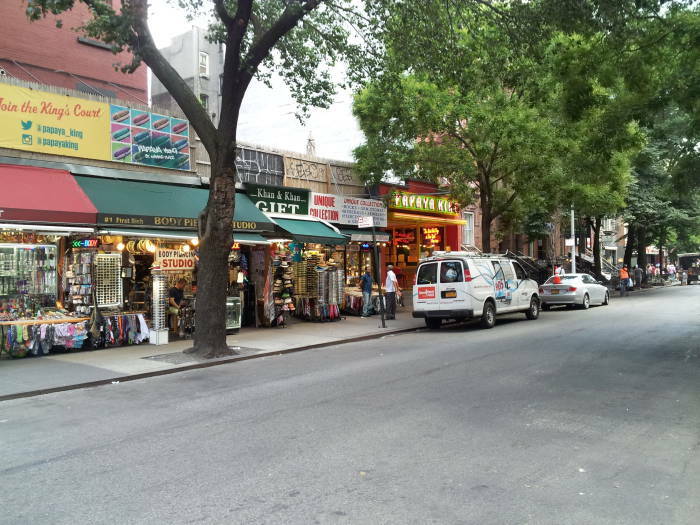 It was the location of a 1895 speech by Police Commissioner Theodore Roosevelt, a 1905 speech by William Randolph Hearst, and the 1914 shootout between the Jewish gang of "Dopey" Benny Fein and the Italian gang of Jack Sirocco, marking the beginning of the dominance of Italian gangsters over Jewish gangsters. It became the Polish National Home or the Dom. That led to the Dom restaurant and its Stanley's Bar. 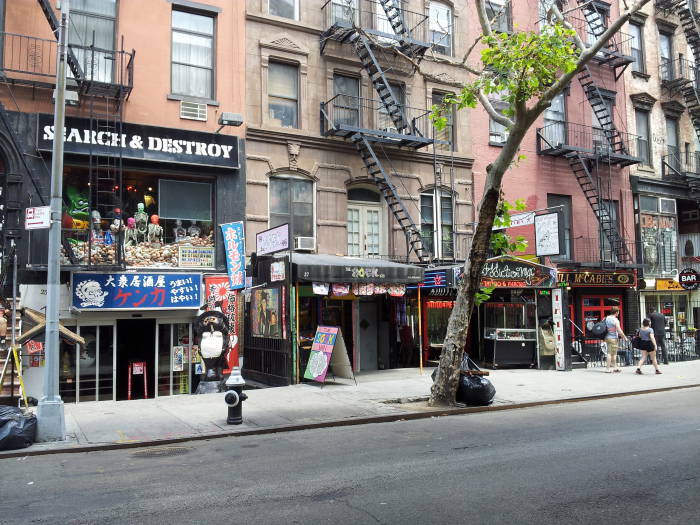 The Fugs played there in the 1960s before Andy Warhol and Paul Morrisey turned it into a nightclub, a showcase for the Velvet Underground and their multimedia stage show The Exploding Plastic Inevitable. 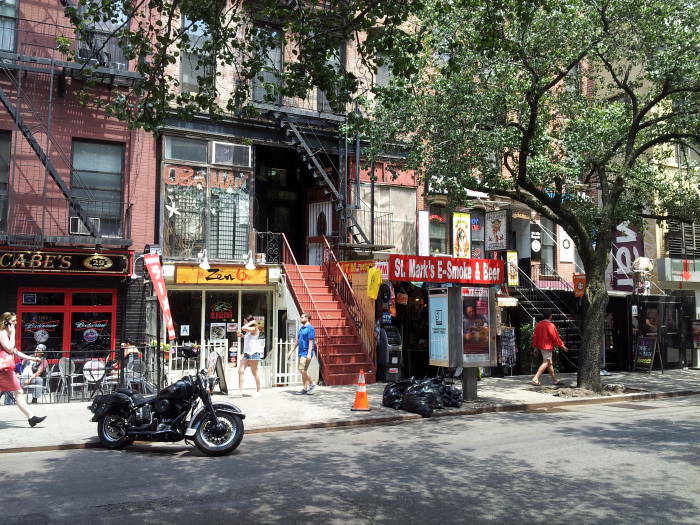 That became the Electric Circus where Jimi Hendrix, Jefferson Airplane, the Grateful Dead, Blue Öyster Cult and many other bands played. 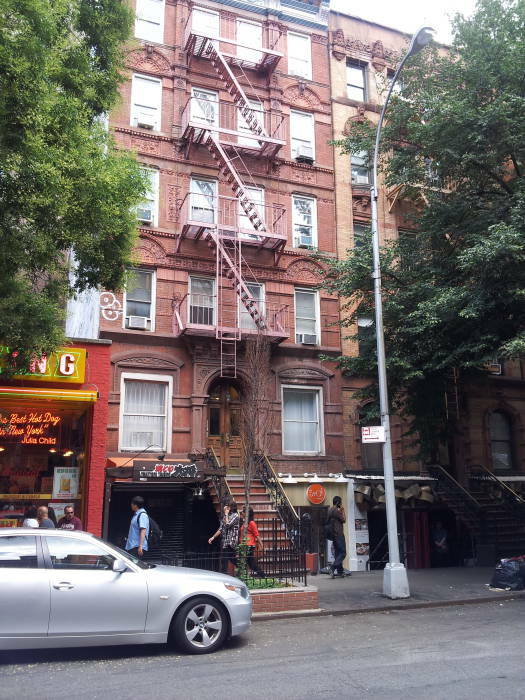 This red brick building is on the west side of Second Avenue just north of St Marks Place. The further, northern part is the Deutsches Dispensary or German Dispensary, it housed an organization established in 1857 to provide medical care to the largely German-speaking neighborhood. 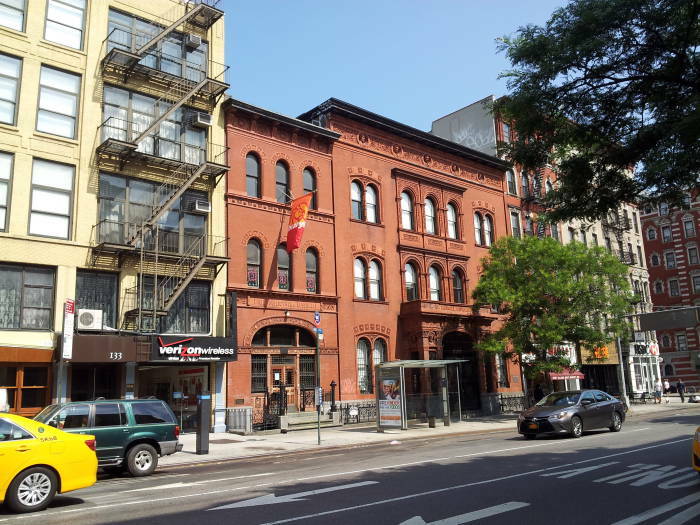 The current red brick building was built in 1884 by Oswald and Anna Ottendorfer, owners of the Staats-Zeitung newspaper. The southern, closer section with the orange and red flag is the Freie Bibliothek und Leschhalle, the Ottendorfer Library. 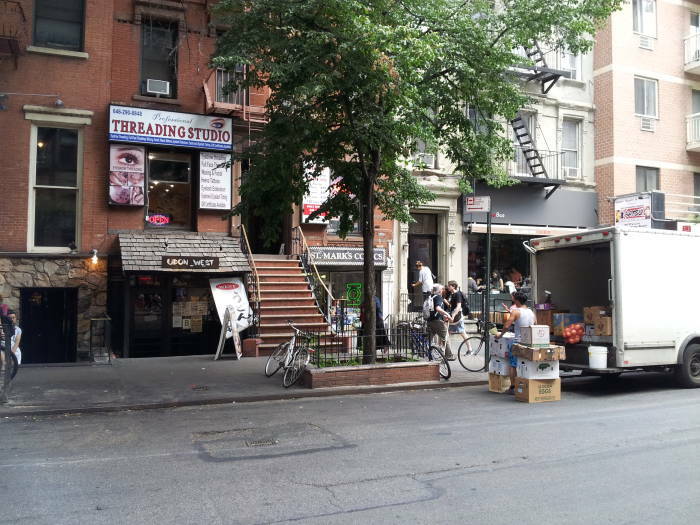 This was the first free public library in New York, offering German and English books. It's now part of the New York Public Library system. 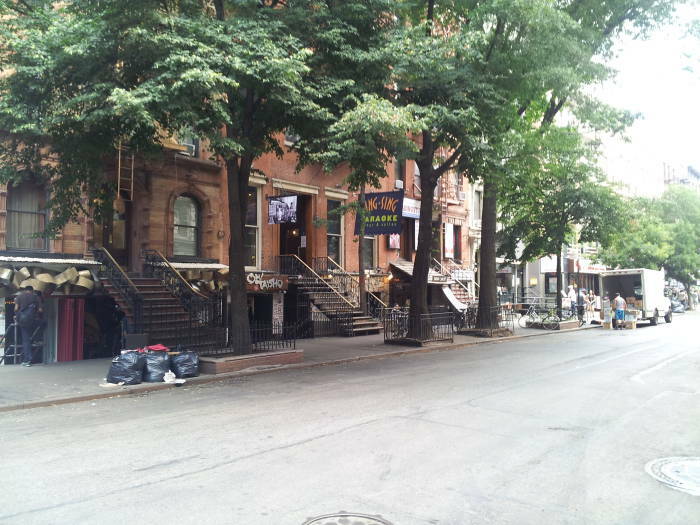 The model for MacLaren's Bar in "How I Met Your Mother"